Mumbai, March 07, 2017: India is likely to have over 1.73 Million new cases of cancer and over 880,000 deaths due to the disease by 2020. Around 70% of all cancer patients approach the doctor when the disease has advanced, and the chances of cure are very low. 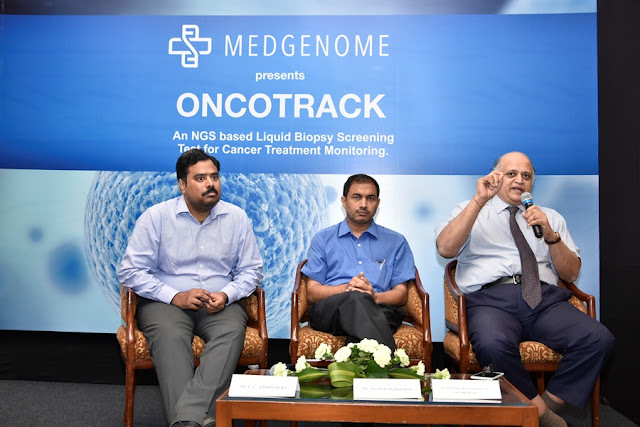 To address and better manage the disease, MedGenome - India’s premier genomics based research and diagnostics company today announced the launch of “ONCOTRACK”. 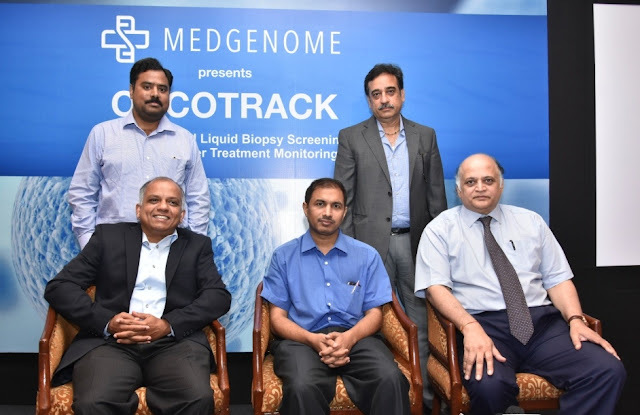 The liquid biopsy based Oncotrack is a non-invasive screening test that is set to transform the way physicians in India can identify genetic alterations, interpret, assess and treat various forms of cancer. The test developed entirely by MedGenome, is the only one to be validated in India and verified from samples of cancer patients from across the country. The test screens the samples by analyzing cell-free DNA that is isolated from the patients’ blood. Using high end sequencing technology, the screening process identifies specific gene mutations that are linked with Melanoma, Lung and Colon cancers. The test facilitates detection of mutation where there is difficulty of obtaining biopsy or in the event of a damaged biopsy material and non-availability of tissue biopsy. This offers Oncologists the power to look for actionable alterations in a patient's treatment, management, without having to do an invasive biopsy or where biopsy is not an option. “Liquid biopsy has the capacity to interpret infinite mutations which will pave the way for new drug discovery, research and therapies. Over thirty five oncologists in India have already screened patients using our Oncotrack. Further, since it has a very patient friendly approach, we are confident it will be very well accepted by the doctors and patients.” said Dr V.L. Ramprasad, COO, MedGenome. MedGenome is a genomics-driven research and diagnostics company with a mission to improve global health by decoding the genetic information contained in an individual’s genome. MedGenome is a market leader for genomic diagnostics in South Asia and a leading provider of genomics research services globally. MedGenome offers genomics solutions in cancer immunotherapy, diabetes etc and works with various commercial and academic researchers globally on genomic research projects. It is also a founding member of GenomeAsia 100K initiative to sequence 100,000 genomes in South, North and East Asia. MedGenome is a global genomics firm with presence in USA, India and Singapore. Our NGS lab in Foster City, California is ISO 15189 compliant, CLIA certified and CAP accredited. Our NGS lab in Bangalore, India is the highest throughput facility in South-East Asia.